The Dual Rotary Crane Lead System utilizes Foremost DR Drill components installed and mounted onto crane leads. Drilling operations can be controlled from auxiliary hydraulics on the crane, or an independent hydraulic power unit (HPU). Intermediate lead sections can be added to the base section to increase the mast length. 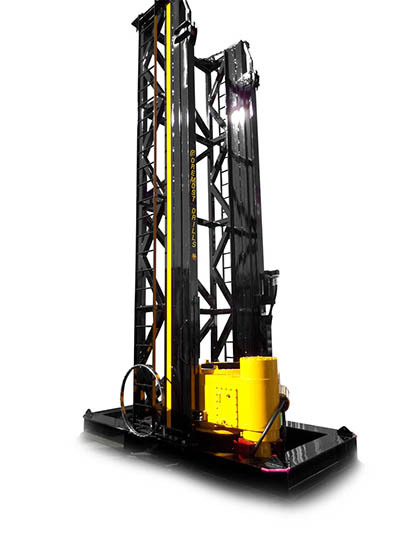 This makes it suitable for various lengths of single pass pile placement, thus increasing drilling productivity. The Dual Rotary Crane Lead system can be operated with a Hydraulic Spotter (this gives rigidity to the mast and acts as a torque arm) allowing pile placement within the radius of the crane. Another option available is an anchored template which acts in place of the torque arm and also acts as a casing guide. Both designs offer accurate pile placement in unstable drill sites. Since acquiring the Dual Rotary technology from Barber Industries in 1993, Foremost has continually updated, refined and expanded the DR line with the goal of enhancing its functionality and extending its range of applications. Today, Foremost offers several DR models, each packed with features that deliver heightened safety, productivity, and profitability across a variety of drilling activities. The optional cyclone sample collecting system slows discharge velocity to allow accurate and continuous sampling of the formation. 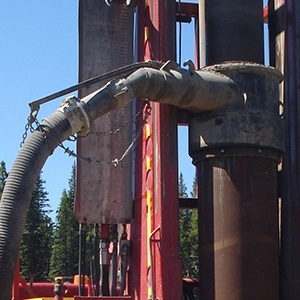 All drill cuttings rise to the surface between the drill pipe and casing, and exit through the discharge swivel attached to the top of the casing. The discharge swivel directs cuttings to a safe dumping point or to an optional cyclone collection system. A carbide-studded casing shoe is welded to the casing bottom. The shoe I.D. is flush with the casing I.D. so that there is no reduction in the bore hole diameter when switching to open-hole drilling. Rotation and feed forces are effectively transmitted from the lower drive to the casing via a set of three carbide inserts. 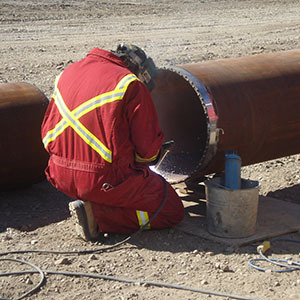 Casing jaws are available for all common casing sizes and can be changed out quickly in the field. The independent hydraulic top drive tilts for convenient loading of drill pipe and casing with the operator standing at ground level. 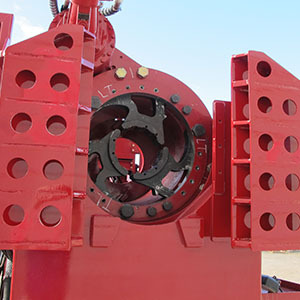 The lower rotary drive is also used as a powerful breakout and spinner for drill pipe, hammers, bits, and thread casing. 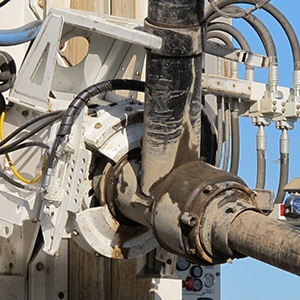 Foremost Dual Rotary drills feature a unique lower rotary drive that is used to advance steel casing through unconsolidated overburden, such as sand, gravel, glacial till, and boulders. Pullback, pulldown, and rotational forces are effectively transmitted to the casing via high-strength steel jaws with carbide inserts. 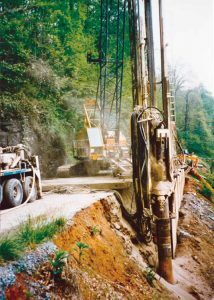 An independent rotary top-drive simultaneously handles a drill string equipped with a down-the-hole hammer, drag bit, or roller cone bit. Cuttings are typically evacuated with air, but Foremost DR-drills can also be configured with pumps for mud or flooded reverse circulation drilling. The top and lower drives feed independently, meaning that the bit position can vary relative to the bottom of the casing. 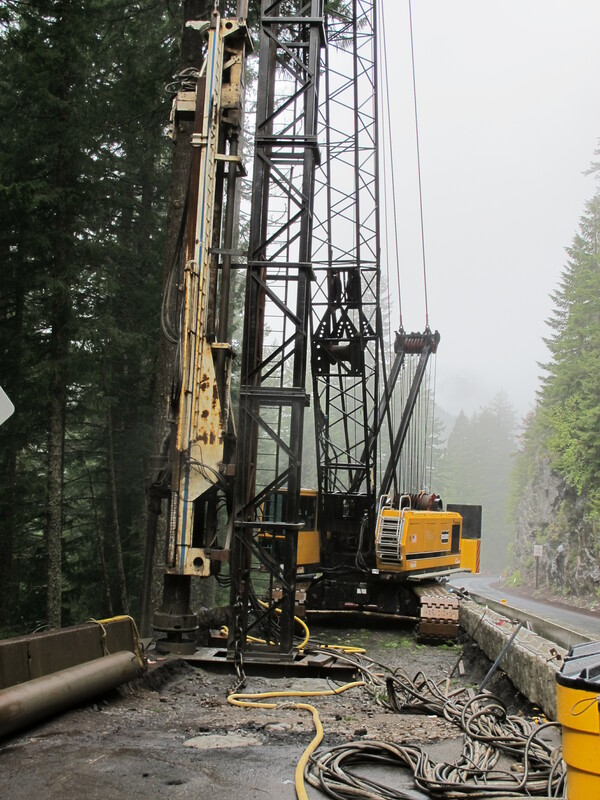 Once the desired casing depth has been achieved, the DR continues drilling open-hole like a conventional top-drive drill. With a Foremost DR-drill, there is no need to trip out or change tools when transitioning to open-hole drilling. 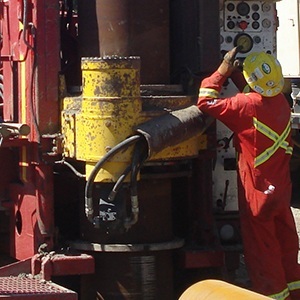 Exceptional Overburden Performance – Foremost Dual Rotary Drills have been proven repeatedly in some of the toughest unconsolidated overburden formations, including sand, gravel, glacial till, and boulders. 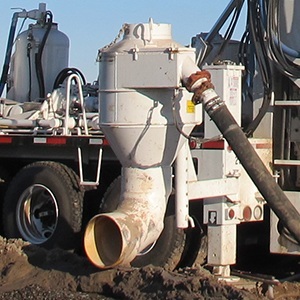 Basin Extraction – The lower drive is equally effective at pulling back casing; thereby simplifying the process of exposing a well screen or abandoning a well. Ease of Maintenance – Foremost DR rigs feature a directly connected hydraulic feed system which means no chains, sheaves, or sprockets to maintain. 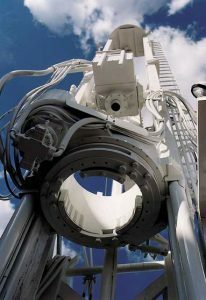 This type of feed system generates zero load on the mast crown, permitting a simple and lightweight mast design that does not sacrifice pullback capability. Reduced Operational Risk – The DR’s flexibility allows you to expand into new applications and gives you confidence to go into areas previously considered off-limits. You will know you you have the right equipment to get the hole down the first time! Resale Value – There is arguably no drill on the market today that holds its value better than a Foremost DR. Dual Rotary owners tend to hold onto their rigs, making used inventory scarce, making for easy re-sale should the need arise. Foremost Technical Support – Foremost’s DR rigs are backed by the expertise and support of our product management team, field technicians, and one of the largest engineering departments in the industry.